The summer capital of Jammu and Kashmir, Srinagar is a scintillating hill resort located ideally in the Kashmir valley. Lovely lakes and roomy houseboats, dry fruits, Chinar trees and traditional Kashmiri handicrafts are the highlights of the region. Mughal Emperor, Jehangir, was so astounded by the beauty of Srinagar that he exclaimed 'Gar firdaus, ruhe zamin ast, hamin asto, hamin asto, hamin asto', which means 'If there is a heaven on earth, it's here, it's here, it's here'. Jhelum River flows through Srinagar, the city of natural wealth and is often referred to as the land of lakes and gardens owing to the abundance of both. 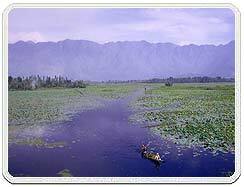 Dal Lake has become an icon of Srinagar but there are several other lakes on its eastern side, Nagin Lake being the most famous one. A ride on the 'Shikaras' or the floating gardens is a delight in itself and the backdrop of the sunset infuses a magical charm to the panoramic views of the lake. The favorite of Mughals, Srinagar has many well laid out Mughal styled gardens such as Chashme Shahi or the Royal Spring, Shalimar Bagh or the Garden of Love and the Nishat Bagh or the Pleasure Garden, on the far eastern side of the Dal Lake. The waterworks in the gardens add to their rich greenish beauty. While animal lovers would like an excursion to the Dachigam National Park, the wildlife reserve 22 km from Srinagar, skiing in winters attract the adventure lovers to Srinagar but it is living in the beautiful houseboats on the Dal Lake, which is to be missed by none. The city has long been a centre of the arts and learning - it has had a university or for hundreds of years and is a centre of Sanskrit study. 'Sri' means beauty or wealth of knowledge and 'Nagar' means city. The city was originally founded by the great Buddhist emperor Ashoka - his old city is marked by the present village of Pandrethan. The present city was founded by Pravarasena II (79-139 AD) who named it "Praparapura" and built it practically contiguous with the old capital, which was called "Srinagari". Praparapura is recorded in Chinese annals by Hiuan Tsang who visited the city in about 630 AD and described it as extending about 4-km from north to south and about 2-km from east to west along the right bank of the Jhelum. King Ananta was the first to transfer his royal residence to the left bank of the river. Legend has it that when Pravarasena decided to build himself a new capital, to choose the location he started walking at midnight and was confronted by a demon on the other side of the Mahasarit River. The demon spread his bent leg across the stream and dared the king to cross over it to the other side. The king cut off the leg with one stroke of his sword and calmly crossed. The demon was delighted with the king's boldness and told him to build the city where he would find the beginnings of a plan laid out for him. The next morning the king found the boundary lines drawn at the foot of Hari Parbat and built his city there. To this day the waters of the Dal Lake are separated from the Tsont-i-Kul by a Sathu or Bund that is shaped like a bent leg. If one is longing for the delights of a houseboat holiday, then check out lakes of Srinagar to try one. 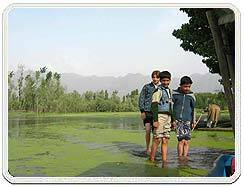 Srinagar is a unique city because of its lakes - the Dal , Nagin and Anchar. The River Jhelum also flows through a part of the city. Most houseboats on the Nagin and the Jhelum are situated on the banks of the lake, and can be accessed directly from land without the help of a Shikara. While all those on the Dal require a Shikara to get to and from them. Most houseboats on the Dal are situated in long straggling rows; some face the boulevard, Srinagar's exciting address, while others are situated singly or in groups of two and three. Srinagar's lakes are the reason why the city receives so many tourists. Not just expanse of water, the lakes is filled with houseboats, villages, narrow water canals, lotus and vegetable gardens and houses and shops. Life on the lakes, as witnessed from the confines of a Shikara, is unique. It is possible to book a Shikara for the whole day and sightsee Nishat Garden, Nasim Bagh, Hazratbal Mosque, Pathar Masjid and Shah Hamdan's Shrine, having a picnic lunch in the boat. While Nagin is quieter, the Dal is full of local colour, with tourists being rowed in Shikara to shops selling every conceivable handicraft - all within the lake. Let's Have A Ride Of The Lake! 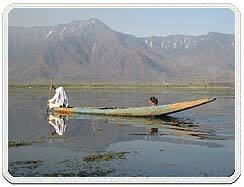 A Shikara ride is one of the most soothing, relaxing aspects of a holiday in Kashmir. It can be an hour-long ride to see the sights of the Dal; a shopping by Shikara expedition to visit handicraft shops within the periphery of the lake; or a whole day trip to visit important city landmarks. Because the Dal is so central to the landscape of Srinagar, many places of tourist interest have, over the ages, been built in its vicinity. The art of designing formal gardens which the Mughal (also spelt as Moghul) emperors expended such time and energy upon, reached its zenith in Kashmir. The Mughal gardens in Agra or Lahore may be very fine but only in Kashmir is the formal beauty of the gardens matched by the natural beauty of the surrounding countryside. The gardens follow a standard pattern with a central channel carrying water through the descending terraces in a delightful series of cascades, falls and pools. Air : Srinagar is well connected by air with Delhi. There is a daily flight to Delhi via Jammu by Indian airlines. There are weekly flights operated by Indian Airlines for Leh from Srinagar. Rail : Srinagar does not have a railway station and the nearest railhead is Jammu Tawi, which is 305 km from Srinagar. Road : Srinagar is well connected by road to important places like Chandigarh (630 km), Delhi (876 km), Jammu (298 km), Leh, Kargil, Gulmarg, Sonamarg, and Pahalgam. Accommodations are plenty here. You may take your pick from a range of luxury and budget hotels and lodges in Srinagar besides the star categorised accommodation hotels around the landmarks of Srinagar offer excellent view of the landmarks through their suites. Most of the places to stay in Srinagar are strategically located in the tourist centers.